The holidays are, in their inexorable way, rolling around again. And with the holidays come the desire to bestow gifts upon those who make your life special. And what gift is more welcome than a sparkly new iPod? Besides a puppy, that is. Right, there isn’t one. At least, not according to millions of people who flock to stores to snap up iPods this time of year. 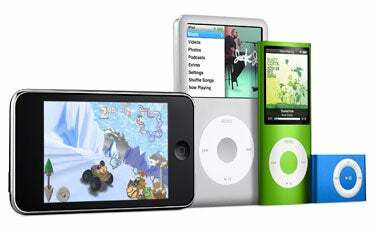 In 2007, Apple sold 22.1 million iPods from October to December, and it’s a safe bet that a sizable percentage of those were exchanged at Christmastime, given as Hanukkah gifts, or otherwise handed over to a friend, colleague, or loved one as a token of holiday esteem. So if you’ve got an iPod or two on your holiday shopping list, chances are you aren’t alone. Remind me again, what’s Apple’s current lineup of iPods? All iPods play music, audiobooks, and podcasts. The iPod touch, iPod classic, and iPod nano can also play videos, including music videos, video podcasts, TV shows, and movies purchased or rented from the iTunes Store. They will also play compatible movies you download from the Internet, rip from your DVDs, or create in applications such as iMovie and Final Cut. The iPod touch, like the iPhone, has a touchscreen interface. You control it by tapping, pinching, and swiping objects on the glass display. The iPod classic and iPod nano use a clickwheel to navigate and control the device. The iPod shuffle has a wheel controller too, but the wheel is really just a four-way switch. It’s the only iPod without a display. How much storage do today’s iPods offer and what colors can I get? The iPod shuffle is available in 1GB ($49) and 2GB ($69) capacities. It’s available in silver, blue, green, pink and red; that latter color is affiliated with the PRODUCT (RED) project for raising money to fight AIDS in Africa. The iPod nano is available in 8GB ($149) and 16GB ($199) capacities. It’s the most colorful clan of iPod, offered in silver, black, purple, blue, green, yellow, orange, pink, and red (once again, affiliated with PRODUCT (RED). 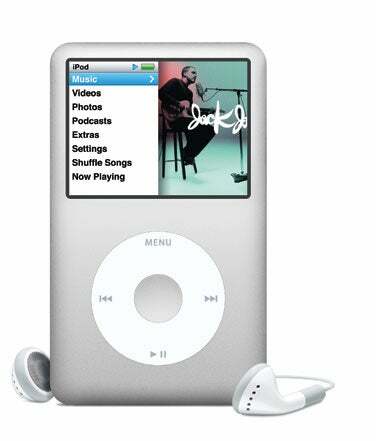 The iPod classic is available in a single 120GB ($249) capacity. It can be had in either silver or black. The iPod touch is available in 8GB ($229), 16GB ($299), and 32GB ($399) capacities. You can have it in any color you like, as long as that color is black in front and polished metal on the back. How do those capacities translate to the number of songs and videos each holds? Why should I get an iPod touch rather than an iPhone? Don’t they do the same thing? There are a few substantial differences. You can’t make a call or send or receive SMS messages with an iPod touch, nor does it have built-in GPS, a camera or support for 3G or EDGE data networks. But in most other respects, the touch is an iPhone without the phone capabilities. With it—and a Wi-Fi connection—you can surf the Web, use e-mail, and purchase music from the iTunes Wi-Fi Music Store and applications from the App Store. And, in fact, there are a couple of good reasons for choosing an iPod touch rather than an iPhone. The first is that an iPhone is the gift that keeps on giving in the form of a monthly service charge from AT&T (or, if you’re in a country other than the U.S., another cellular service provider). An iPhone also requires that the owner sign a contract with AT&T (or, again, another provider in other countries), and this may mean your holiday snookums has to break their existing contract and pay a substantial penalty to their current carrier. What size screen does each iPod have? 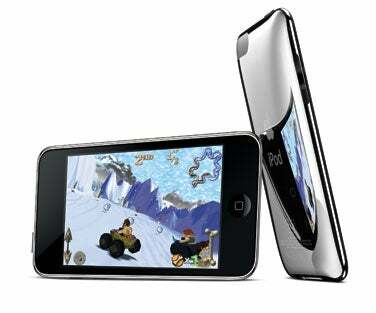 The iPod nano has a 2-inch display; the iPod classic has a 2.5-inch display; and the iPod touch has a 3.5-inch display. (All iPod displays are measured diagonally.) The iPod shuffle, of course, has no display. Yeesh, a 2-inch screen sounds pretty tiny. Can I really watch movies on an iPod nano without my head exploding? You can. Imagine you’re watching a movie on a cheap airline that hasn’t upgraded its movie screens so that you’re viewing the drop-down monitor from six rows back. That’s a reasonable approximation of how large the iPod nano’s screen will appear to you. For an iPod classic, move up a couple of rows. Throw an iPod touch in front of your face and you’re sitting in Business Class. Am I going to have to purchase a bunch of extra stuff to go along with my iPod gift? Not necessarily. The basics—and we mean basics—come in the box. In that box you’ll get the iPod, earphones, and a USB 2.0 cable for connecting the iPod to a computer to charge and sync. The iPod shuffle’s cable includes a small docking stand. The iPod nano, iPod classic, and iPod touch instead include a dock adapter—a plastic insert for accessories such as speakers, clock radios, and docking stations that use Apple’s Universal dock design. The iPod touch also includes a polishing cloth. On the other hand, if your gift recipient already has an older iPod and lots of accessories for it, it’s worth noting that some of those accessories may not be fully functional with the latest iPods and iPhones. Specifically, current models require special circuitry to output video to TVs, and these models charge only via USB power (many older, and some current, accessories provide power via the dock-connector port’s FireWire pins). So your gift may require its recipient to spend some of their own hard-earned dough on accessory upgrades. I’ve heard mixed reviews about the iPod’s headphones. Are they any good? How many white earbuds do you see jammed into the ears around you? That’s correct, lots and lots. Most people are perfectly happy with the included earbuds. But some people are more particular and abandon Apple’s earbuds for a set of headphones they feel fits and/or sounds better. We’ve also got some advice on upgrading from Apple’s earbuds. What’s this Genius feature I’ve heard about? It’s a feature built into iTunes 8. The idea is that you can tell iTunes to anonymously send a list of all the music in your iTunes library to Apple’s Genius servers, where the data is compared (again, anonymously) to the libraries of every other iTunes user out there. Apple sends the results of this analysis back to your computer, allowing iTunes to create playlists of music—called, curiously enough, Genius playlists—based a song of your choosing. (Where “based on” roughly means “that other people with that song in their library also like.”) For example, if I choose Led Zeppelin’s “Black Dog” in my iTunes library and click on the Genius button, iTunes produces a list of 25 related tracks from my library, including Jim Hendrix’s “Purple Haze,” Janis Joplin’s “Piece of my Heart,” and Pink Floyd’s “Money.” The Genius feature will also present you with a list of related tracks you don’t own but that are available from the iTunes Store. Genius isn’t limited to iTunes; the current iPod nano, iPod classic, and iPod touch models let you create Genius playlists directly on the iPod. I’m not sure my boyfriend has a computer. Does he need one to use the iPod I give him? Yes. You sync media and data to the iPod with a computer. Find out his computer status before buying. OK, he does have a computer, but I don’t know what kind. Will the iPod work with both Macs and PCs? Almost certainly. iPods are compatible with both Macs (running Mac OS X 10.4.11 or later) and Windows PCs (running Vista or Windows XP Home or Professional Service Pack 3 or later). iPods don’t work with computers running Linux. But then you’re far too nice a person to be dating a Linux user. This is all very helpful, but I’m still not sure which iPod to get. What more can you tell me? Lots. Let’s break down each model and offer suggestions about who might best appreciate it. Capacity and cost: 1GB ($49: Get Best Current Price) and 2GB ($69: Get Best Current Price). Colors: Silver, blue, green, PRODUCT (RED), and pink. Battery life: Up to 12 hours of audio playback. What’s changed since the last generation: Nothing other than the case colors. Who it’s for: Exercise fiends, those who don’t need an iPod with a display, those with small music collections, those on a budget. Who it isn’t for: People who want to watch video on their iPod; those who want to pack a large music collection with them; those who frequently browse their music on the go. What we think: The iPod shuffle is the perfect iPod for the active user. With its flash memory it won’t skip when you’re bouncing around on a trampoline and its small, light, clip-on design makes it easy to strap to your workout togs. It’s also an ideal “first iPod” for kids who are likely to lose the thing or put it through the wash. Read our full review. Capacity and cost: 8GB ($149: Get Best Current Price) and 16GB ($199: Get Best Current Price). Colors: Silver, black, purple, blue, green, yellow, orange, PRODUCT (RED), and pink. Battery life: Up to 24 hours of audio playback, up to 4 hours of video playback. What’s changed since the last generation: The fourth-generation (4G) iPod nano is taller than the previous 3G iPod nano. Like the iPod touch it includes an accelerometer, which means that when you turn it, the iPod becomes aware of its position and can change the orientation of the display’s content. This is the first iPod with a “shake to shuffle” feature—just give the iPod a vigorous shake when it’s playing music to skip to another track and engage the iPod’s shuffle feature. The 4G iPod nano, like the current iPod classic and iPod touch, allows you to create Genius playlists directly on the iPod. Who it’s for: As the most fashionable iPod, the 4G iPod nano is for anyone who appreciates sleek and colorful gadgets. It also offers a good amount of storage space in a still-tiny package. While its 2-inch display may cause some to squint when viewing long movies, most will find it a perfectly fine iPod for watching videos. Who it isn’t for: People with large music collections and want all that music with them at all times; those who want the best video-viewing experience available on an iPod. What we think: The nano is the flagship of Apple’s traditional (read: non-touchscreen) iPod line, offering lots of features in an attractive, compact design and at an affordable price. If the shuffle is aimed at exercisers and the classic is for the digital packrat, the nano is the iPod for everyone else. You can’t go wrong giving a nano—it’s the best selling portable media player on the market for good reason. Read our full review. Capacity and cost: 120GB ($249: Get Best Current Price). Battery life: Up to 36 hours of audio playback, up to 6 hours of video playback. What’s changed since the last generation: The current second-generation (2G) iPod classic differs only slightly from the original iPod classic: it comes in a single capacity of 120GB (as opposed to the 80- and 160GB capacities of the previous model), and it allows you to create Genius playlists on the iPod. Who it’s for: Anyone who wants to carry a boatload of media with them; anyone who finds the nano’s display just a little too tiny. Who it isn’t for: Loved ones who want a colorful and smallish iPod and those with a limited media library. What we think: The iPod classic is all about capacity. Count us among those iPod owners who do have massive media libraries, and because we do, we cherish this iPod’s capacity. We also appreciate its battery prowess—providing plenty of juice to get through an international flight. Read our full review. Capacity and cost: 8GB ($229: Best Current Price), 16GB ($299: Get Best Current Price), and 32GB ($399: Get Best Current Price). Colors: Black on the front and silver on the back. What’s changed since the last generation: Unlike the original iPod touch, the second-generation (2G) iPod touch has external volume controls and a built-in speaker. It also has a full complement of applications that mirror the iPhone’s save for phone- and camera-centric applications such as SMS messaging, the phone and message capabilities, and the Camera application. Who it’s for: Anyone who admires the Internet and multimedia capabilities of the iPhone but doesn’t need an iPhone; movie lovers who want to watch on the go. Who it isn’t for: Careless kids who might slam it into concrete or drop it in the sink; anyone looking for hands-free operation (you really need to look at the iPod touch to use it). What we think: Some contend that the iPod touch is today’s most capable portable media player (you can count us among that number). It’s also a heck of an Internet communication device (provided you’re within reach of Wi-Fi). The ability to purchase music via the iTunes Wi-Fi Music Store and add applications to the iPod touch with the App Store is too cool for words. Read our full review. Senior editor Dan Frakes contributed to this article.